I’m still wearing the awesome Pro Compression Trainer Low socks and am happy to be able to share them with someone else! Over the last couple of weeks, since I first tried the Trainer Low socks, I’ve accumulated quite a few. I now have 4 pair of the white, 4 pair of the purple and 2 pair of the pink. Today, I am sporting the pink trainer low’s while I live life, work, sit at my desk and commute back and forth to the city. At least my feet are happy, even if it’s snowing AGAIN. I was asked by several people in last week’s comments about these socks. They are slightly thicker than the Pro Compression Marathon (tall) socks. The foot bed, particularly the grey area, has a bit of padding that makes them softer. They have a cushioned feel that my Marathon socks do not possess. In fact, when I put the Marathon socks on with my trainers, I need to adjust the laces because they are thinner than my normal running sock. However, I don’t have to make adjustments when I wear the Trainer Low socks. Although they do not feel thick, they are thicker than the Marathon socks. This is good in my world but I wanted to point it out for those of you who asked since I know we all have different preferences. 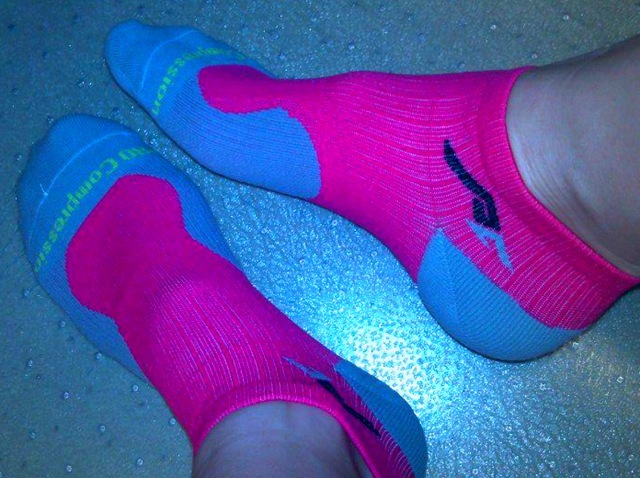 NOW …… The winner of a free pack of Pro Compression Trainer Low socks is #69, SeeMommyRace! Congrats, Melanie! Please email me at amanda@tootallfritz.com with your color/size preference and your mailing address. 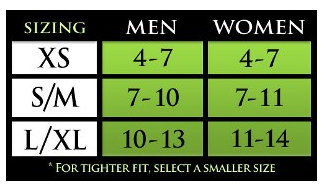 You can reference the size chart below to get the proper fit. The rest of us can use the $5 off & free shipping discount code to purchase more of the Trainer Low socks. The $5 discount brings each 2 pack of the Trainer Low’s to $20. The code is: TTF Shop HERE. This entry was posted in "Run"Way Fashion, Giveaways, Product Reviews and tagged Awesome running socks, cushioned running socks, favorite running socks, Pro Compression Socks, Pro Compression Trainer Low Socks by tootallfritz. Bookmark the permalink. I can’t wait to get my calf sleeves. I hope they are half as awesome as the pivot shorts! The calf sleeves are awesome. I wear them for recovery too, after long runs. Put on fresh Aspaeris Pivot Shorts and the calf sleeves and am much better off after a couple hours of “lounging” in them. Ordered some—can’t wait. Thanks for the tip!